Mosquito & Tick Prevention: Let Us Help You! - Flaggship Landscaping, Inc.
As many Maine residents know, the long-awaited transition into spring at the end of the winter is quite a beautiful and enjoyable time in Maine. The days start to get longer, the weather finally gets warm enough to spend days outside, without being all bundled up. However, as the days get warmer and we enjoy the time we can get outside, those pesky mosquitos and ticks can become overwhelming! Here at Flaggship we can help you prevent those mosquitoes and ticks for this upcoming spring season. There are many ways to prevent mosquitoes and ticks; in our experience we have found the most success with our Mosquito & Tick Prevention Plan. We have a team of experienced and licensed professionals who visit your property and treat tick infested areas, as well as preventatively spray the property line. Our preventative plan includes three separate treatments, spread 30-45 days apart; that provides a distinct barrier around your property from mosquitoes and ticks. By preventatively spraying your property in the early months of spring, it will effectively treat your property making it safe and pest free for your family and pets! In Maine there has been an increase in reported cases of Lyme disease over the past several years, according to the Portland Press Herald, “Except for a slight down turn in 2015, reported cases of Lyme disease have now broken records in Maine every year since 2011. There were 1,787 positive tests for Lyme in 2017, a 22 percent increase over the 1,464 Lyme cases in 2016, according to statistics compiled by the Maine Center for Disease Control and Prevention.” Though our Mosquito & Tick Prevention Plan may not eliminate your chances of getting or being exposed to Lyme disease, it will create a safer space for your family and pets to enjoy the outdoors. Deterrent Plants – There are many varieties of plants that can deter ticks, as well as mosquitoes. We can help homeowners order specific plants and the installation of these plants onto the property. 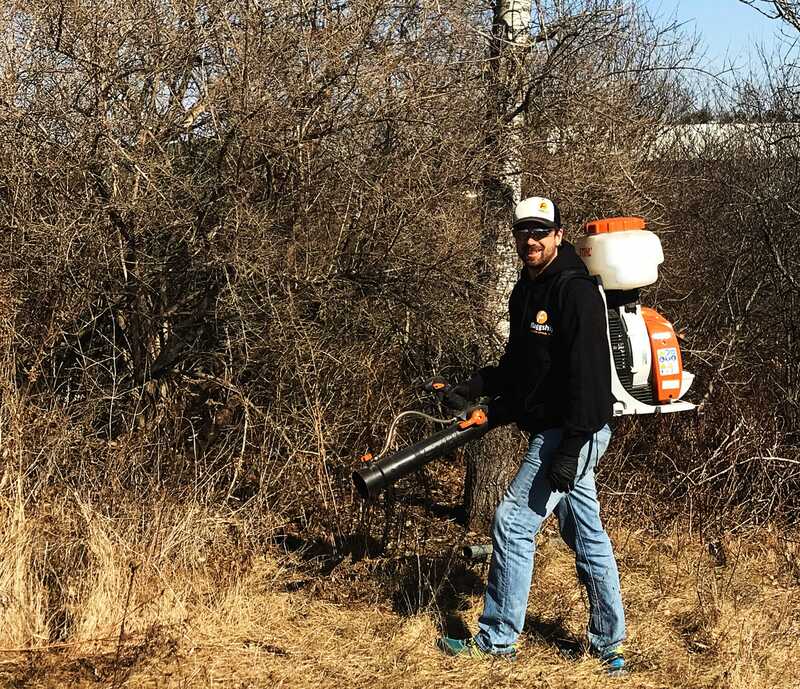 Bush Hogging – Ticks tend to populate in longer grasses, fields, and wood lines. We provide bush hogging services to efficiently cut back over grown fields or long grasses on your property. Lawn Maintenance – Frequently mowing your lawn also deters mosquitoes and ticks from breeding. We offer weekly and bi-weekly mowing services for homeowners in the Southern Maine region. Bark Mulch Installation – In specific cases, a wide bark mulch barrier can be used around the wood line of properties to deter ticks and mosquitoes. We have specialized equipment and the experience to install this for you neatly and efficiently. Water Drainage Solutions – We also offer many creative and unique solutions to displace pooling water on low areas of your property. Often these areas become breeding grounds for mosquitoes, because of the stagnant water. As each situation is different, we can provide homeowners with specific solutions to solve this drainage issue on their property. Our knowledgeable staff can help you with any questions or concerns you may have, so please Contact Us today, or call the office at 207-510-7777 to get on the schedule for the Mosquito & Tick Prevention Plan!